When you have a friend that appreciates a practical gift, it can be a little challenging to come up with a fun and whimsical way to give it. 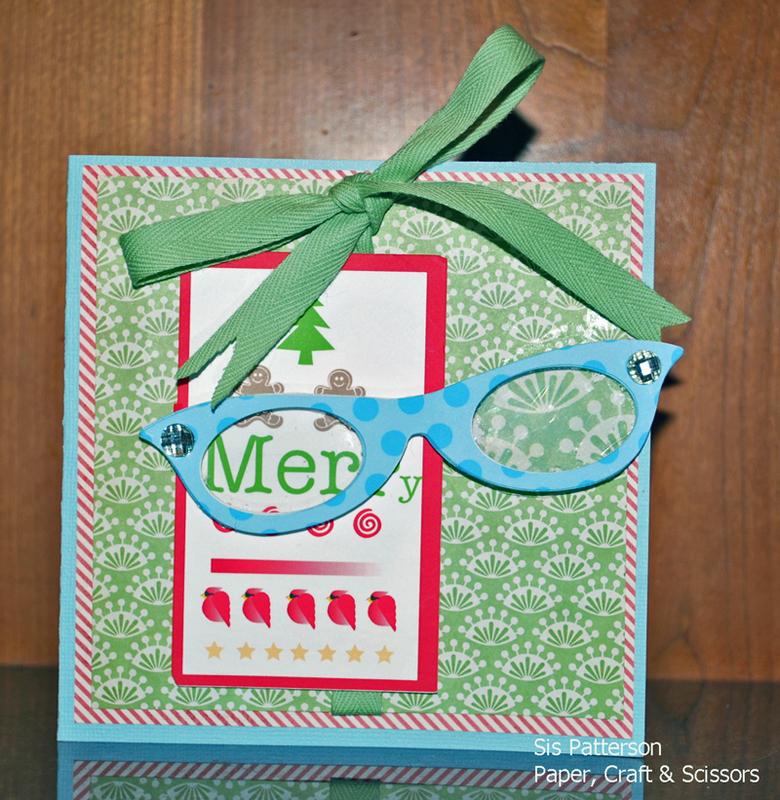 Fortunately, my Silhouette Cameo answered the call and helped me make this: a Christmas Eye Chart and Specs card. I used Silhouette’s print and cut feature to create the eye chart. If I was to do it again, I would use a distinct motif for each position on a row (like an eye chart), but I think it conveys the message as is. The glasses are from Lori Whitlock. I used the pattern fill feature to flood the glasses with the blue polka dot pattern. I cut a total of four pairs of glasses and layered them for dimension. To make the acetate lenses (hand trimmed and glued to the lowest layer of the glasses) more realistic, I increased the size of the “Mer” which would appear through the lens and made the “y” smaller as it peeked out under the nose bridge of the glasses. 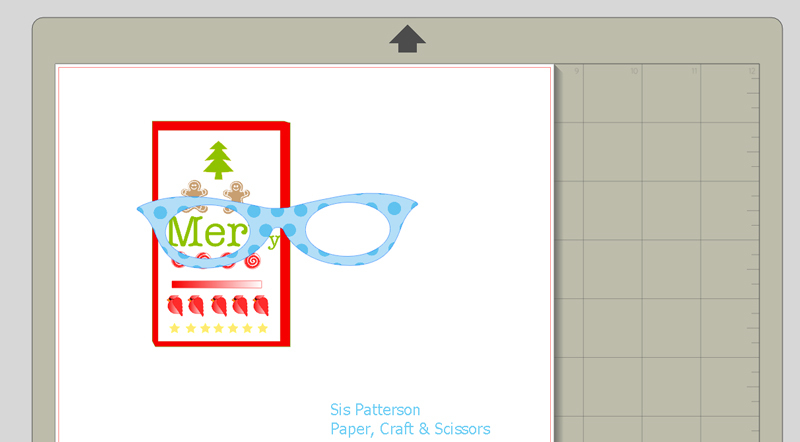 Below is a screen shot which shows how I checked the alignment before printing and cutting. Note: I did not cut the glasses on top of the eye chart. This just shows how you can check alignment before cutting. For additional magnification for the right-hand lens, I used a 12×12 paper to hand cut the lens shape. First I determined where the glasses would be attached to show the “Mer”, then I adhered the larger print to the same smaller pattern from a 6 x 6 paper pad that I used as the first layer of patterned paper in the card. The glasses are pop-dotted above the chart and the patterned paper. To finish the card, I added some retro rhinestones, a bow, another layer of patterned paper, and the 5.5″ card base. The sentiment inside informs the recipient that an optometrist appointment and new glasses are coming. This is a PERFECT card for a gift of new glasses!!! I love that you magnified the text that goes behind the lens!!! Very clever and a special touch that makes this card really read so well. You’ve made a practical gift even more special and very personal– I love this effort and I know the recipient will too!! This a great card. I like your design and the thoughtful custom style you created for the recipient. The magnification of the eye chart and lens is fab! I am certain the person receiving this card will enjoy the design and a very practical gift. Merry Christmas. OMG! Sis, you are unbelievably AMAZING!!!!!!!! I love, love, love the glasses & how you magnified the “MER” behind the lens…but, I swear, I never, ever, EVER woulda thought to magnify the paper pattern behind the other lens : OOOOO That’s my jaw droppin’ to the floor face! I just know that Santa’s gonna bring you somethin’ extra special just to reward your attention to details!! Fabulous Sis! You always manage to come up with the PERFECT project! Love the magnification detail as well. I’m sure your recipient with LOVE this! I see you are rocking that Silhouette! Such a cute card!!!! Lots of details!!! Hope you had a wonderful holiday my friend! Hugs! Ok, One of the coolest cards ever!!!!! You always amaze me!!! What fun fun fun. I love it. Wow! I really like how you were able to create this! What a fabulous card! Lol….how did I miss this….I must need a new prescription….so stinking clever and hilarious. Love it!